Sometimes when troubleshooting mobile device connection issues, it is necessary to remove all drivers for the mobile device. On the PC: run the Command Prompt as Administrator. In the list that appears, right-click cmd.exe (or Command Prompt), then Run As Administrator. Approve any security prompt that appears. The Device Manager will open. View menu, Show Hidden Devices. With the command from Step 2, this shows non-present devices as grayed/ghosted icons. For each of the objects in Step 6, right-click, then Uninstall. 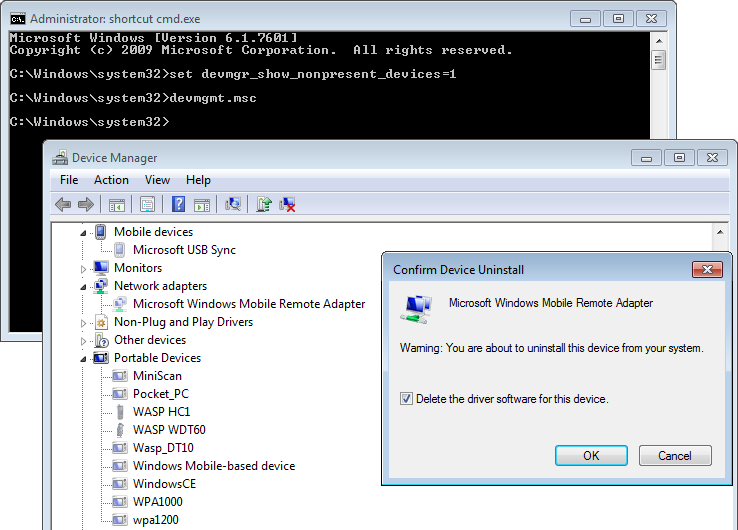 If there is a checkbox for "Delete the driver software for this device", check it. Click OK. Repeat this step until they're all gone. To get Windows to re-poll for devices, right-click the PC name (at the top of the Device Manager list), then click Scan For Hardware Changes.